Under the Eiffel Tower, amongst the stunning landscape shots we see as we peer through the window of the hotel, there is a sense that this weekend will be a moment of change. Nick reveals his lack of security in his job and teases Meg, vainly hoping that she may allow one night of passion, while Meg seems to be pushing forward; keen to make a change and move ahead with her life – could she be interested in a new man perhaps? Her tone switches from cheeky and excited to snarky and harsh within moments – one moment discussing plans, the next telling her husband he’s a “f**king idiot”. Their arguments are passionate and full of resentment and brutal honesty – but something works. Something works between them on a level that only thirty years of marriage truly understands. Not a smug, rose-tinted version of a successful marriage but a revealing portrait that doesn’t veer down a route of sadness and overwhelming loss – such as Amour. In fact, if you consider Richard Linklater’s Before Sunset/Before Sunrise/Before Midnight trilogy as a starting point, there are many similarities between the films. Both detail a specific moment in a relationships history within a European city – and the couples are both creative ‘types’ with passionate women. In fact the limited time-period and memorable meals in both Before Midnight and Le Week-End give the impression that maybe writer Hanif Kureishi may have had a hint of inspiration from Linkater’s films. The performances are mesmerising and Jim Broadbent and Lindsay Duncan manage to create characters that are familiar and charming to be in the company of. Decisions to “not tell the kids” about failing to pay a bill and their playful chasing in the hotel lobby is warm and relatable – and young adults will surely watch the film and realise that their own parents may not be as stuffy as they let on. Indeed, the child on the other end of the phone line becomes the buzzing bee that irritates – and a quick swot is needed. 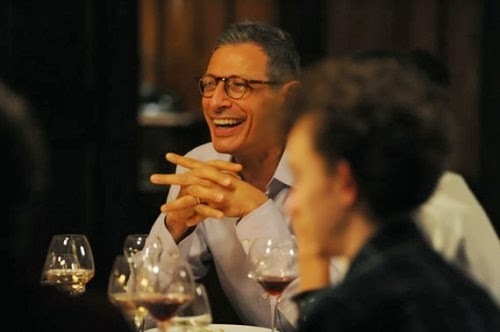 Far from being a laugh-out loud comedy or deeply-depressing drama, Le Week-End manages to have its French Fancy and eat it, as Nick and Meg see through the weekend in a splendid fashion as Jeff Goldblum hosts a memorable meal with a black-comedic twist. An adoring film that may not be unique, it has a charm that could see it as ‘Before Old Age’ – and, in fairness, that’s not a bad thing to be.